I present to you this deliciously easy and quick recipe. In under 20 minutes you’ll have yourself an exotic dinner. Great for a romantic meal served with red wine or also for the whole family to enjoy! Blueberry’s are packed with antioxidants and are in season. 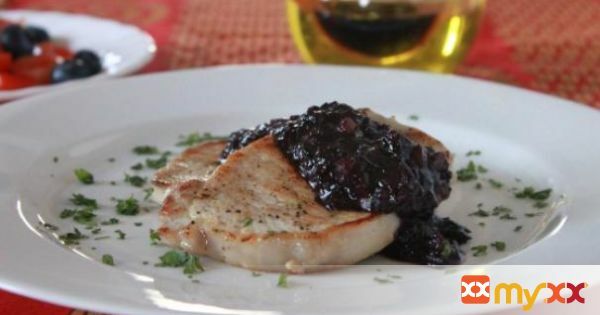 You can omit the pork for roast chicken, both proteins go great with this blueberry sauce. Don’t hesitate to try this because it’s super healthy, easy, and delicious! 2. In a nonreactive bowl, mash the blueberry’s with the brown sugar to desired consistency, then set aside. 3. Heat saute pan on medium. Season the pork chops with salt and pepper on both sides. Add canola oil to the saute pan. Brown pork on both sides until golden and crispy, about 2-3 min on each side. 4. Remove from pan and place on a baking dish to finish cooking in the oven. Depending on thickness of the pork. If it’s thin keep warm aside until sauce is ready. 5. In the same pan the pork was cooking in, add the chopped red onion, saute until translucent. Then add in the mashed blueberry sugar mixture and balsamic vinegar. Cook until the sauce gets thick, about 2-3 minutes. 6. Add in the lime zest and juice and season with salt and pepper. If you put the pork in the oven, remove and place on serving plates. Serve sauce on top and garnish with parsley or cilantro. Enjoy!